ASTRA32, also known as Advanced System Information Tool is a handy utility that performs a thorough and complete scan of your system. The scan includes useful information. In just a few minutes, ASTRA32 analyzes in detail the full make-up and configuration of the computer, all hardware items and all connected devices, and then includes a list of programs running. 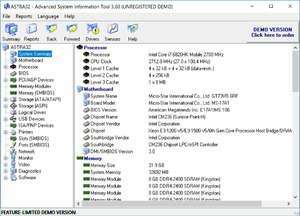 It also displays a list of potential driver errors and a troubleshooter, memory module details, video card information and several other pages specializing in different areas of the computer hardware and software configuration. ASTRA32 - Advanced System Information Tool 3.60 is a shareware program and can be used as a demo to try the software until the free trial period has ended. A full version of the program is available after the trial period ends. For security reasons, you should also check out the ASTRA32 - Advanced System Information Tool download at LO4D.com which includes virus and malware tests. Additional screenshots of this application download may be available, too.